Received March 12, 2019; Accepted March 27, 2019. BaTiO3 is known to be an environmentally friendly electronic material with a phase transition temperature that can be controlled through the substitution of an appropriate additive. Physical changes of grain growth in Ba0.9Sb0.1TiO3 were analyzed by adding a small amount of antimony to pure BaTiO3. The Ba0.9Sb0.1TiO3 solid solution with antimony substitution was prepared under various calcination and sintering conditions. The optimal conditions for sintering were confirmed and the grain growth process was clearly understood. As a result, the relationship between the dielectric properties and the polycrystalline structure of Ba0.9Sb0.1TiO3 substituted with antimony was confirmed. The maximum dielectric constant of the Ba0.9Sb0.1TiO3 solid solution was found to exceed about 5500 and the dielectric constant at room temperature reached nearly 4000. The transition temperature of Ba0.9Sb0.1TiO3 was shifted closer to room temperature than that of pure BaTiO3. 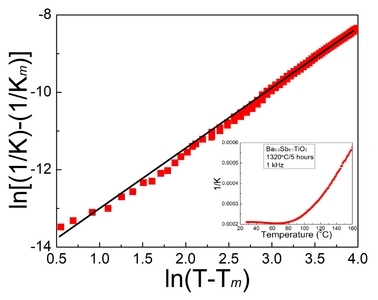 Unlike the phase transition behavior of pure BaTiO3, the dielectric constant curve, which is a function of temperature for all samples, showed a very gradual change. In the era of the Fourth Industrial Revolution and the upcoming revolutionary 5G communication, more environmentally friendly and reliable electronic materials are required. In particular, the demand for multilayer ceramic capacitors (MLCC) with semiconductor devices is increasing rapidly . Environmentally friendly BaTiO3 (BT) has the advantage that its phase transition temperature can be shifted to room temperature through the substitution of an appropriate additive. In particular, the field strength and frequency dependence of BT on additives is very high [2–4]. In this respect, BT is an electronic material with several advantages over other materials. In the fabrication of BT electronic materials, synthesis and heat treatment have a strong influence on the mechanism of doping, generation of defects, resulting crystal structure, and ultimately the properties of BT. The purpose of this study is to investigate the effect of antimony on the microstructure and physical properties of antimony-doped Ba0.9Sb0.1TiO3 (BST). This research is necessary to develop eco-friendly electronic devices, which are indispensable in the electronic materials industry of the future. BST solid solutions were prepared using high-purity oxides BaO, TiO2 and Sb2O3 as raw materials. Calcination was performed at a temperature range of 1180 °C to 1220 °C, and compact BST solid solutions were synthesized by firing at 1290 to 1320 °C for 5 h. Because Sb3+ (133 pm) has a calculated atomic radius distinct from those of Ba2+ (253 pm), Ti4+ (176 pm), and O2− (48 pm) ions, charge imbalance occurs when Sb3+ substitutes BT. Grain growth, stabilization of the crystal structure, and atomic percentage of the fabricated BST solid solutions were confirmed by scanning electron microscopy (SEM), X-ray powder diffraction (XRD), and energy-dispersive X-ray spectroscopy (EDS). Dielectric properties were measured using an LCR meter, an environmental chamber, and a control unit and interface. The dielectric constant and loss were measured as a function of temperature at various frequencies from 102 and 105 Hz and at a heating rate of 4 °C/min. Pure BT crystals are known to have two phases, tetragonal and cubic. When the XRD of the sintered powder, shown in Fig. 1(a), was observed, the (222) pyrochlore phase was clearly observed at around 31 degrees in two-theta. The pyrochlore phase of the calcine powder was observed in Fig. 1(a), but as shown in Fig. 1(b), this pyrochlore phase disappeared when the sintering powder was sintered at 1320 °C for 5 h, that is, only the phases corresponding to the perovskite phase clearly were observed. All samples can therefore be understood to have been subjected to proper sintering treatment. Each subfigure in Fig. 2 shows the XRD pattern of BST samples heat-treated at various sintering temperatures. The calcine temperatures in Figs. 2(a)–(d) are different. The numbers 1, 2, 3, 4, and 5 in the XRD data set indicate the calcination temperatures 1180, 1190, 1200, 1210, and 1220 °C, respectively. 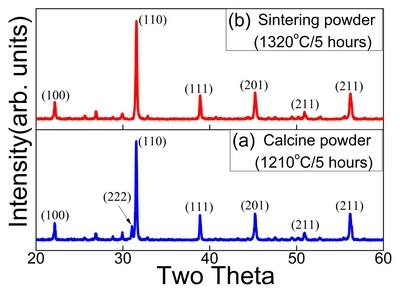 Even though the calcine treatment temperature was different, the (222) pyrochlore phase in the XRD graph of the sample sintered at 1320 °C was almost extinguished and could not be observed. Heat treatment at a sintering temperature of at least 1320 °C is considered necessary to remove the pyrochlore phase, which reduces the physical properties. The BST sintered at 1320 °C showed a relative intensity of (110) perovskite phase about 2 % higher than that of the sintered sample at 1310 °C. These results indicated that sintered BST at 1320 °C can be expected to have a stable BO6 structure as a whole, which improves its ferroelectric properties. The addition of impurities greatly affects the physical properties of BT. Figure 3 compares the EDS of pure BaTiO3 with that of BST with Sb3+ added. Figure 3(a) shows the EDS spectrum of pure BT; a typical BT spectrum is shown. The EDS spectra in Fig. 3(b) show that the addition of Sb3+ ions is associated with non-homogeneous particles. 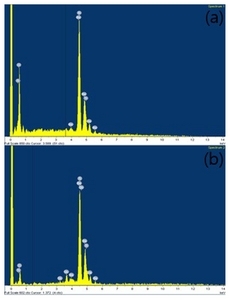 As a result of the analysis of EDS results, the atomic percentages of Ba2+, Ti4+, and O2− of pure BT were found to be 18.95, 18.09, and 62.96 %, respectively. On the other hand, when BST was substituted with Sb3+, the atomic percentage of Sb3+ was measured to be 3.53 %. Therefore, the atomic percentages of Ba2+, Ti4+, and O2− were changed to 37.11, 26.20, and 33.16 %, respectively. Due to the non-uniform distribution of Sb3+ and the segregation of the sample, the presence of the non-ferroelectric region in the BT sample causes the degradation of the dielectric properties. Comparing the pure BT with the Sb3+ substituted BST, the atomic percentage between the atoms is found to be significantly changed. The addition of such impurities greatly affects the crystallization kinetics of solid solution materials, because the diffusion kinetics during the sintering process are affected by the presence of charge-compensating defects. Substitution with Sb3+ causes charge imbalance due to different oxidation states. When the ionic radii are compared, Sb3+ replaces Ba2+ in the A-site perovskite lattice. Thus, high-valence ions can replace low-valence ions, eventually resulting in charge imbalance and defect structures in the BST sample. Although a large amount of Sb3+ is detected through EDS, the effect on microstructure uniformity is negligible. When Sb3+ replaces Ba2+, the differences in atomic radius and valence change the pore concentration of the crystal to compensate for the change in charge. In general, the energy required to bond the dopant ions in the individual lattice sites of the complex oxide is related to the formation of compensating defects while combining the distortions (different ionic radii) and the aliovalent ions (different valences). Thus, the solubility at two different lattice sites of BST is dependent on the energy required to form compensating defects. BST sintered at 1320 °C had normal grain growth and relatively uniform microstructure. In the case of polygonal particles, EDS did not show the presence of Sb3+. The presence of a chemical heterogeneous system in the BST sample was different from the Nb5+ and Ta3+ doped BT, leading to a reduction in dielectric properties. Figure 4 shows a SEM micrograph of the fracture surfaces of the BST solid solutions. In the case of the solid solution, the number of crystal grains of the specimen composed of the powder increases with a decrease in the number of pores. The grains of the sintered BST solid solutions had a size of about 1.5 – 2.5 μm and formed into relatively dense grains. As the sintering temperature increased, the solution was formed into a sintered body having a greater number of dense and large crystal grains. However, BST showed a slightly smaller grain size than the BT system with Nb5+, Ta5+, Bi3+, and Ca2+ added [2–5]. Figure 5 shows the sintering temperature dependence of the dielectric constant of BST. In Fig. 5, A, B, C, D, and E indicate samples heat-treated at the calcination temperatures of 1180, 1190, 1200, 1210, and 1220 °C, respectively. As the sintering temperature was increased from 1300 to 1320 °C, there was no significant change in the dielectric properties, but overall, the dielectric constant increased, while the dielectric loss tended to decrease. As shown in Fig. 5, the increase in sintering temperature shows improvement in dielectric properties even though the calcine treatment temperature is low. However, the sintering temperature of BST is required to be maintained at a temperature of 1120 °C or more. In the synthesis of the solid solution, although the final heat treatment conditions are appropriate, the characteristics of the sample are not expected to improve if the first heat treatment state is incomplete. All samples sintered above 1310 °C showed a dielectric constant of about 4100 or higher and a dielectric loss of less than 0.05 at room temperature and 1 kHz. Dielectric constant and loss were measured in the frequency range of 102 to 105 Hz. E1, E2, E3, and E4 shown in Fig. 6 indicate samples heat-treated at sintering temperature conditions of 1290, 1300, 1310, and 1320 °C, respectively. The dielectric constants of all samples showed a tendency to decrease slightly as the frequency required increased energy for dipole rotation. Thus, a significant change in the dielectric constant is due to the higher energy required for the orientation of the dipoles as the frequency increases. These results were similar to those reported by other researchers. As shown in Fig. 6, the frequency dependence of the dielectric loss is similar to the frequency dependence of the dielectric constant. These results show that BST has more crystal defects in its crystal structure, and that Sb3+ ion exchanges with Ba2+ ions at the A-site of ABO3. Therefore, optimal addition of Sb3+ to pure BT is considered to reduce the local disorder around the Ba2+ atom and also affects the local structure of Ti4 + . Figure 7 shows the characteristic change of ln[(1/K)-(1/Km)] for ln(T-Tm). In the case of BST, a dielectric response that continuously reduces the dielectric constant in the phase transition region is observed. Figure 7 shows that the degree of diffusion index can be changed by replacing Sb3+ in the Ba site, so that it can be expressed as a critical index γ. Figure 7 also shows that the degree of diffusion index of BST synthesized by replacing Sb3+ in Ba2+ site can be expressed as a critical index γ. Generally, the critical index γ of a normal ferroelectric is 1, while the critical index γ of a diffused phase ferroelectric is 2. The γ was obtained by using the modified Curie-Weiss law and using the change in dielectric properties with respect to temperature. The γ of BST decreased slightly as the sintering temperature increased, although this was not shown in Fig. 7. The characteristics of BST, including the particle size of the sample increasing with increasing sintering temperature, can be confirmed by the EDS shown in Fig. 3 and the SEM shown in Fig. 4. Many researchers have reported that this diffusion phenomenon is due to local compositional changes as a result of the formation of multiple micro-domains, and that each region undergoes phase transitions at different Curie temperatures [5–7]. The chart in Fig. 7 shows the change of the reciprocal dielectric constant with temperature of BST ceramics. 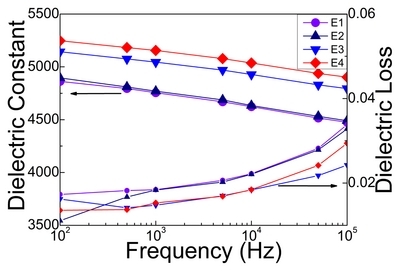 Because the BST composition doped with Sb3+ is not uniformly distributed, it has a small effect on inherent dielectric parameters such as Curie temperature. These changes in physical properties have been actively studied by many researchers in the synthesis of BT substitutes for A and B sites [8,9]. 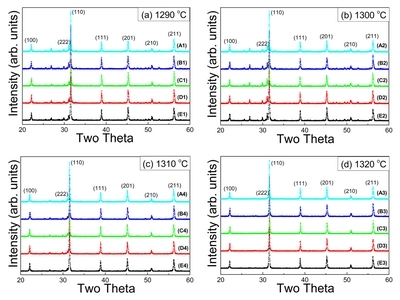 In this study, the synthesis of BST substituted with Sb3+ in pure BT was confirmed to be very sensitive to the sintering temperature condition. 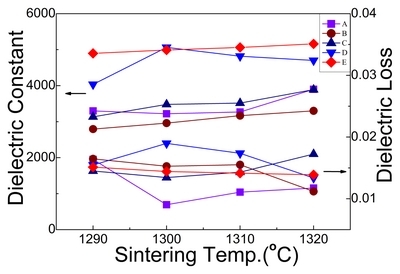 The sintering temperature was also found to be more important than the calcination temperature. The optimum sintering temperature was found to be 1320 °C. In addition, the fine grains and high density of BST solid solution resulted in its uniform dielectric properties. The dielectric behavior of BST was in agreement with the presence of the tetragonal structure observed through XRD. The dielectric constant of BST reached 4100 at room temperature. This result indicated that the Sb3+ substituent affected only a slight change in the local structure around the perovskite A-site, and that this local structure can be conjectured as a pseudo-cubic crystal. Therefore, the crystal structure of BST is considered to represent a certain tetragonality. The relatively fine structure of BST had a uniform substituent distribution in the crystal structure. As a result, BST substituted with Sb3+ was analyzed for large changes in dielectric properties with temperature change. The experimental results showed that, compared to the phase transition temperature of pure BT, that of BST was shifted closer to room temperature. the dielectric behavior in the phase transition temperature range above the Curie temperature of BST generally satisfied the modified Curie–Weiss law. Fig. 1. (Color online) XRD patterns of BST solid solutions. 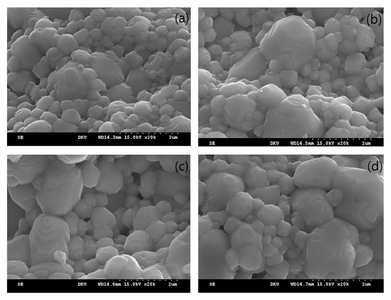 (a) calcine powder and (b) sintering powder. Fig. 2. (Color online) XRD patterns of BST for various sintering temperatures. (a) 1290, (b) 1300, (c) 1310, and (d) 1320 °C. Fig. 3. (Color online) EDS images of (a) pure BT and (b) BST solid solutions. Fig. 4. SEM micrographs of BST surfaces for various sintering temperatures. (a) 1290, (b) 1300 (c), and (d) 1320 °C. Fig. 5. (Color online) Sintering temperature dependence of dielectric constant and loss of BST solid solutions at 1 kHz. Fig. 6. (Color online) Frequency dependence of dielectric properties of BST solid solutions. Fig. 7. (Color online) Dielectric properties of BST solid solutions. AJ. Moulson, and JM. Herbert. Electroceramics (Wiley Press, New York, 2003). YJ. Kim, JW. Hyun, HS. Kim, JH. Lee, MY. Yun, SJ. Noh, and YH. Ahn, Bull Korean Chem Soc. 30, 1267 (2009). YJ. Kim, Appl Sci Converg Technol. 27, 126 (2018). S. Tangjuank, Appl Phys Lett. 90, 072908 (2007). R. Mahbub, T. Fakhrul, and MdF. Islam, Procedia Eng. 56, 760 (2013). L. Curecheriu, MM. Vijatovic Petrovic, JD. Bobic, and BD. Stojanovic, Appl Phys A. 119, 681 (2015). A. Jain, N. Makhuri, R. Saroha, M. Pastor, AK. Jha, and AK. Panwar, Adv Mater Lett. 7, 567 (2016). Q. Liu, J. Liu, D. Lu, T. Li, and W. Zheng, Materials. 12, 678 (2019). MH. Khedhri, N. Abdelmoula, H. Khemakhem, R. Douali, and F. Dubois, Appl Phys A. 125, 193 (2019).